Providence’s Wilbury Theatre Group has opened a play about today’ s teenagers and how they live and love, and hate. The Public Radio’s Bill Gale says the work has some sharp moments and some difficulties, too. Over the years, the American theater has helped us define and make sense of youth, in plays like “The Boys in the Band” in the 1960s and “Tea and Sympathy” in the 1950s, and “Angels and America” and others. Now along comes “The Burn” a hard hitting 90 minute work from Chicago’s Steppenwolf Theater. Written by Philip Dawkins, a faculty member of Chicago’s Loyola University, it’s about a group of teens who live and love, and hate, each other. Three of the kids are just plain nasty some of the time. Their day is spent trashing their fellow students, not to mention working on their teacher once in a while too. At first, they seem like just big-mouthed kids having fun. But then, things change for the worse. And the troublemaker? The internet. 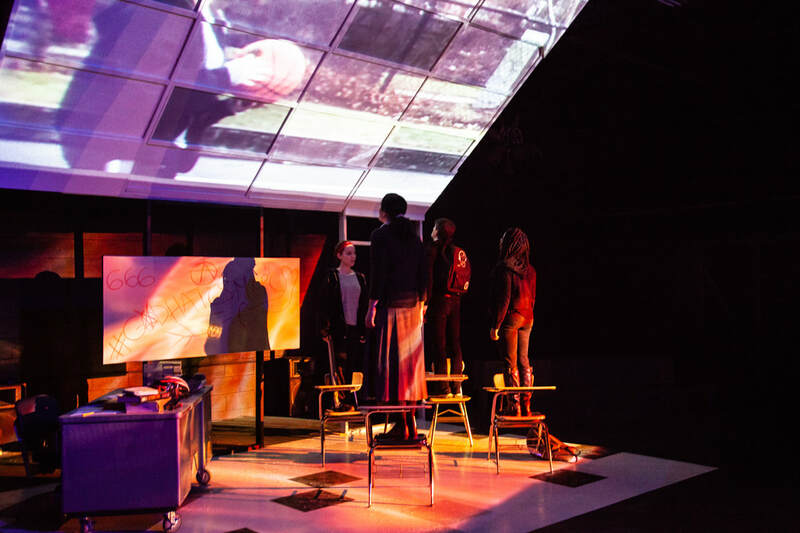 Playwright Dawkins’ view is that no matter what the net has to offer that’s useful, it also provides a full house opportunity for “cyber-bullying” that can, and does, ruin opportunity and destroy lives. From there, “The Burn” is a quicksilver at everybody’s worst sides. And that seems to me to be a little too much. “The Burn” just goes too far, at times, making the youngsters one-dimensional characters that are almost all bad, all nasty. At the Wilbury director Logan Serabian gives his performers lots of chances to take over the show and Sarah Leach certainly does that. She plays Mercedes, a God-fearing young lady who, dressed in an ankle-length skirt, tries to be good all the time. She delivers a fine performance. As the teacher, Bran Lang, a Wilbury regular, he does all he can to keep the kids from going all the way over the wall. Those youngsters, played by Shannon Hartman, Jeff Hodge and Daraja Hinds, in spite of their meanness, reveal students as having some decency. And “The Burn” has a point to make. The internet, with all its power and opportunity also can be used to tear up lives, to ruin good works. This production just goes a little too far in making that point. But then, we all probably should put down that little electronic box we carry around everywhere. We don’t have to spend the whole day talking into it, making it the pointed center of our lives all too much. “The Burn” continues through February 3rd at The Wilbury Theatre Group in Providence. Bill Gale reviews the arts for The Public’s Radio. "The Burn" at The Wilbury Theatre Group.